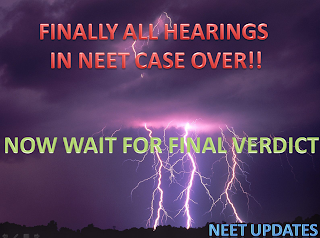 NEET CASE TC(C)98/2012 LAST HEARING WAS ON APRIL 25TH.SO MUCH CONFUSION PREVAIL AFTER APRIL 25TH WHETHER NEXT DATE IS FOR VERDICT OR HEARING ..NOW COURT WEBSITE UPDATED CASE STATUS.NEXT HEARING ON 30TH.FINAL CAUSE LIST FOR 30TH APRIL NOT PUBLISHED YET.WE CAN EXPECT THIS WILL BE FINAL HEARING.. 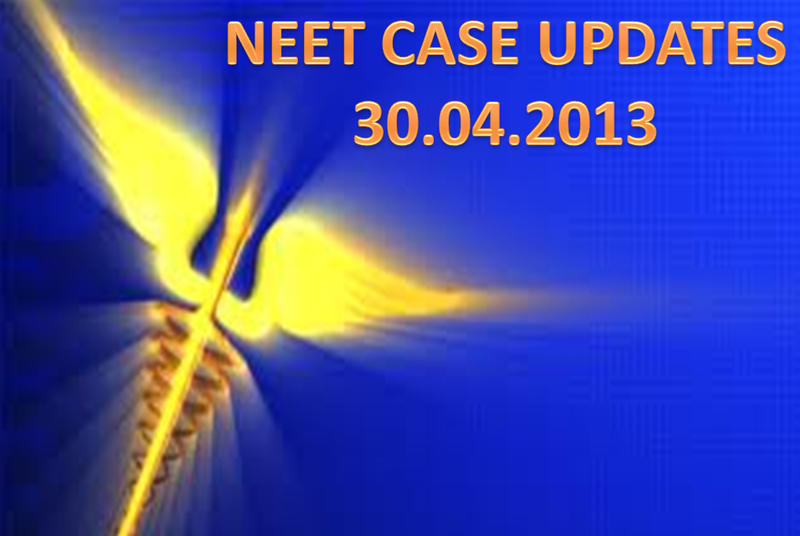 FINAL CAUSE LIST FOR NEXT TUESDAY(30.04.2013) PUBLISHED NEET CASE INCLUDED AS ITEM NO 1 .CASE IS FOR HEARING NOT FOR ORDERS .INCLUDING 30TH APRIL ONLY 3 POSSIBLE HEARING DAYS REMAIN BEFORE SUMMER HOLIDAYS.MOSTLY CASE WONT DELAY BEYOND SUMMER HOLIDAYS. ITEM NUMBER 1 IN COURT 1.BENCH WILL SIT UP TO 2.55pm.WHOLE DAY OF HEARING AGAIN ON 30TH APRIL.CAN EXPECT CASE WILL END ON 30TH. .MOSTLY CASE WILL GET OVER THEN..
12.35 pm HALF AN HOUR TO GO BEFORE LUNCH BREAK..STILL NEET CASE CONTINUES IN COURT 1. 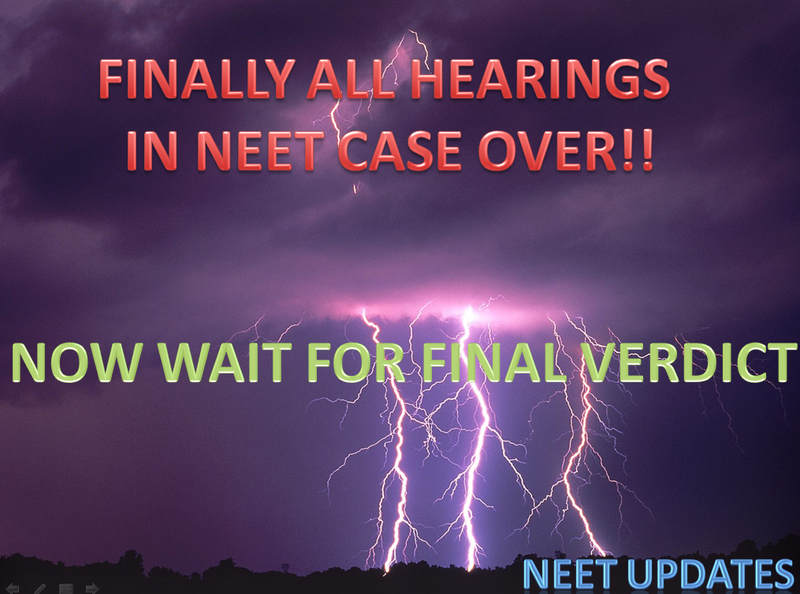 NEET CASE OVER..ALL LAWYERS WILL SUBMIT WRITTEN SUBMISSION..WILL INFORM YOU MORE DETAILS SOON..WRITTEN SUBMISSION WILL BE MADE BY ALL LAWYERS BY THURSDAY..VERDICT DATE WILL BE GIVEN LATER..
What is the possibility of NEET verdict in vacation? Thousands waiting ,When can NEET results expected? .“There is no clarity in the court’s order on the time frame or extension of deadline for the counselling ".Dr IV Reddy.
."students who aspire to gain entry into medical colleges at the MBBS, BDS and the post-graduate level have been caught in a legal tangle for no fault of theirs and are the victims of policy decisions". 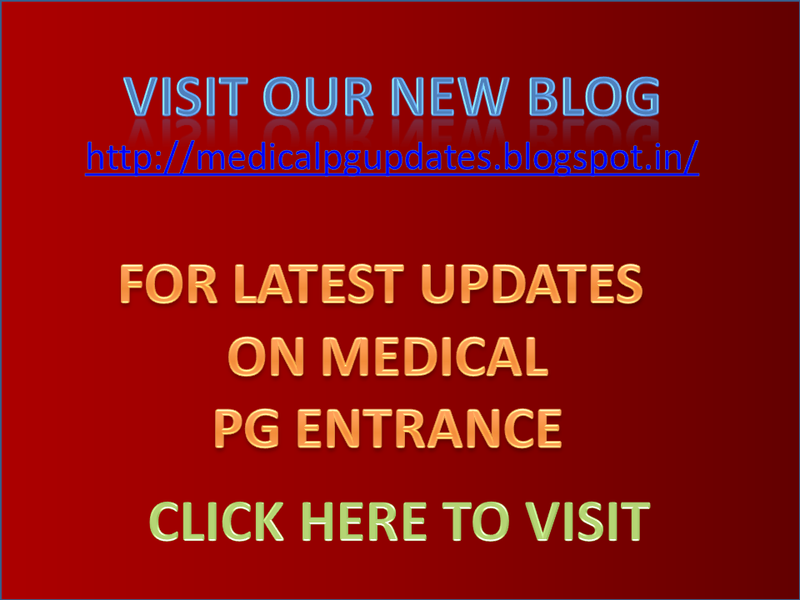 .PG ADMISSIONS HIT :The NEET controversy had affected even the Medical PG admissions.
."everything" would be done to ensure that students are not affected in any manner. "That's all I can say right now",Dr KK Talwar said. 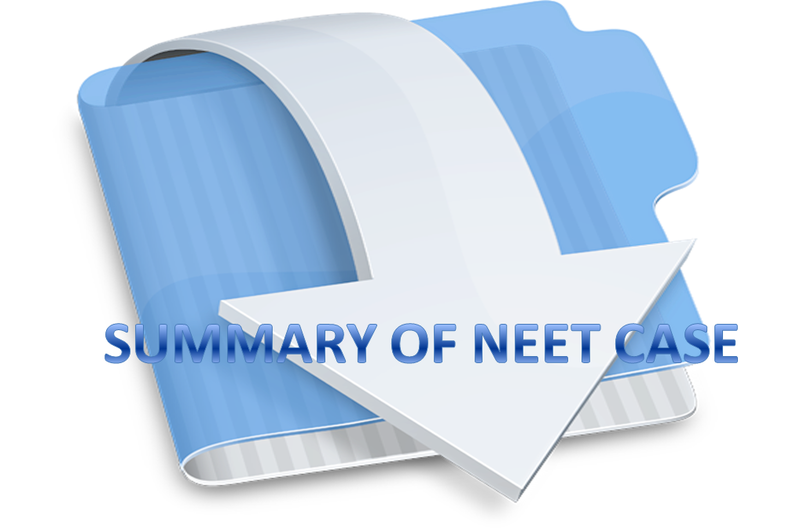 .Thousands waiting ,When can NEET results expected? .Name 'NEET' Is it deliberately named so..
.This report in lokmat paper is to support private colleges what u think? .What action government or MCI take against advertisements for selling pg seats in various site? .Do you have any sincerity to your 2012 batch?? .BHU application final date april 15..is that possible? When we stand here at the end of all hearings and waiting for verdict we can just look back what all had happened in NEET case. Private medical colleges and many state governments move to honorable supreme court against NEET and for conducting their on exams. admission into B.D.S. and M.D.S. Examinations. specially fixed matters on 15th, 16th and 17th January, 2013.
listed along with these Transferred cases and the writ petitions. the results of the same, until further orders of this Court. 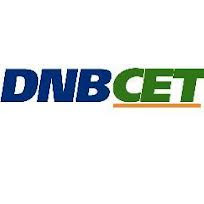 entrance examination, may have knowledge of the same.